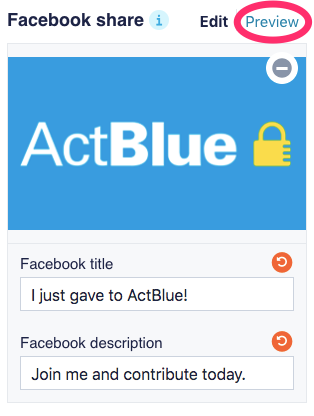 After donors finish a contribution, we give them an option to share that they donated on social media. 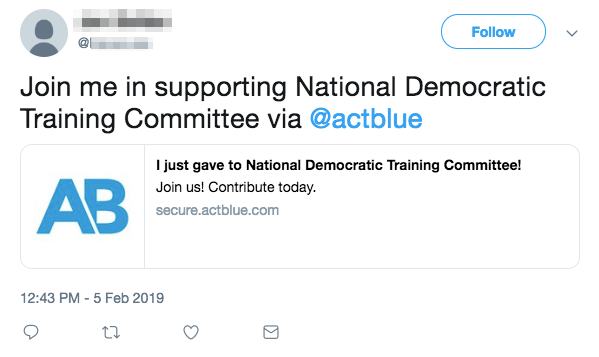 This is a great way for them to share their passion with their social networks and organize on your behalf, because their posts will include the link to your contribution form! 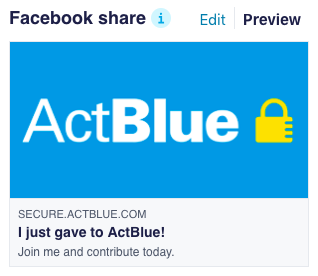 And with ActBlue’s tools, it's easy to customize what people will see on Facebook and Twitter when someone posts your contribution form link — you can even create reusable and default social share settings to save you time and effort in the future! Both examples get the important information across, but custom settings make a much bigger impact. A professional photo or image is much more inviting to click on, and customizing these settings only requires a little effort! 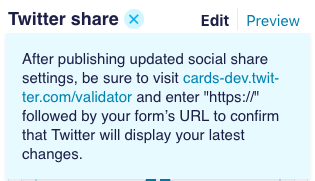 To set up social share settings for a particular contribution form, find the form in the “Contribution Forms” tab of your Dashboard, open its form editor, and go to the “Social share” tab. 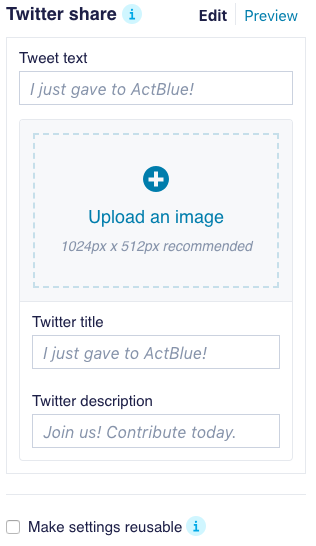 Here you can add a title, description, and image for Facebook and Twitter posts, as well as custom text for tweets! 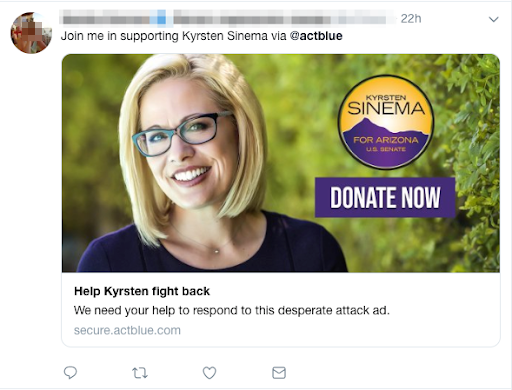 After customizing your text and uploading an image, click “Preview” to see what your text and image will look like when shared on Facebook and Twitter. If you upload an image and decide you want to change it, just click the grey minus button to remove it. Once you’re happy with your social share settings, click the green “Publish” button at the top of the form editor to make your changes live! 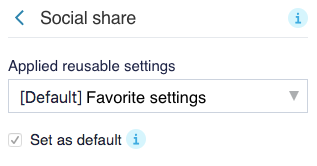 If you want your social share settings to be reusable, simply check the “Make settings reusable” box at the bottom of the form editor and give them a name before publishing your changes. 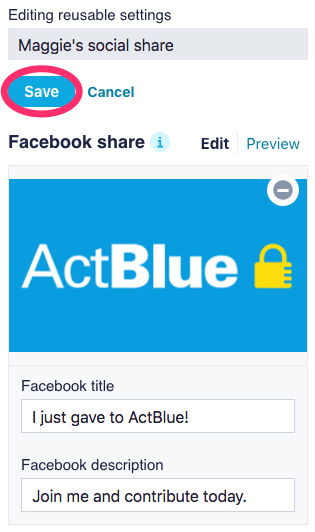 The next time you go to the “Social share” tab for one of your contribution forms, you will have an “Applied reusable settings” dropdown where you can easily select a reusable setting to use! 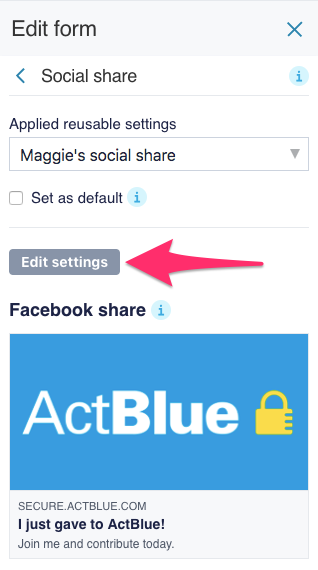 If you do not name your social share settings before publishing, they will be custom to that form, not reusable (you will have to customize settings again on other forms). 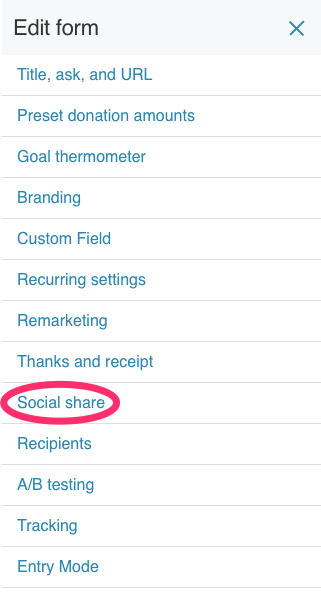 However, if you clone a form with custom social share settings, those settings will be duplicated on the new form. 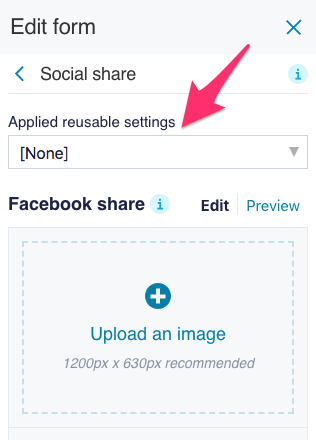 If needed, you can edit reusable settings in the “Social share” tab. Just select the setting you want to edit from the dropdown and click the gray “Edit settings” button. You’ll be able to edit and preview the settings just like when you created them, but please note that when you’re done editing reusable settings, clicking the “Save” button will make your changes live across all forms currently using those settings. Unlike making other changes in the form editor, you will not need to click the “Publish” button for changes to your reusable settings to go live. 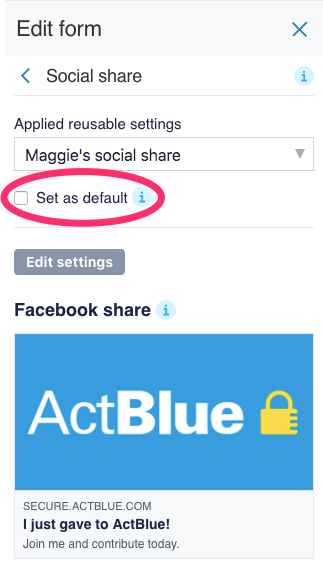 In addition to creating reusable social share settings, you can also designate default social share settings for your campaign or organization. To set a default, select the reusable setting you want from the dropdown and check the “Set as default” box before publishing your changes. From then on, all brand-new forms you create will automatically have the default social share settings applied, except for new clones of forms with different settings. This means you won’t have to worry about setting up social share for new forms in the future! If at any time you select a different reusable setting to be your default, it will only be applied to brand-new future forms, not pre-existing forms that use an old default or new clones of forms with different settings. 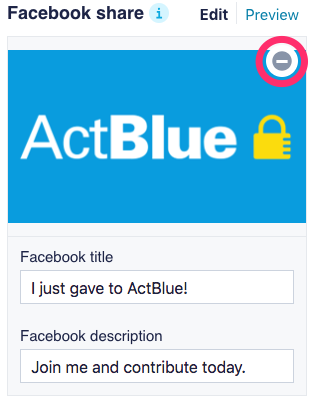 If needed, you can quickly and easily remove reusable social share settings from a contribution form by selecting “[None]” from the “Applied reusable settings” dropdown and then clicking the green “Publish” button. Lastly, please note that you may need to wait a few minutes after publishing your changes before Facebook and Twitter will cache your image so your social share settings will look like the preview in the form editor. 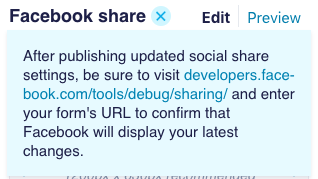 To see if your image is ready, visit the debugging links we’ve included in the information buttons next to “Facebook share” and “Twitter share” in the “Social share” tab. You will need to be logged in on both sites to use their debugging tools. Social share is a really powerful way to expand your reach, fill the social networks of your supporters with your memorable brand, and raise more money. We highly encourage you to take a minute to customize it!